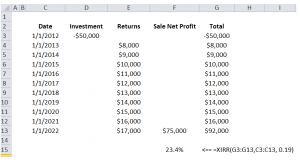 I thought I’d start up the MBA Monday series again (NPV, Accounting, Investing and all sorts of other goodies) to bring you a really cool calculation you can do in excel that you may not have heard of. It’s called Internal Rate of Return. It’s important because it provides you with an investment return when the inputs aren’t simple to calculate. A simple hypothetical investment like buying Apple stock at $250 and selling it a year later at $500 is simple. 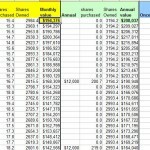 Apple pays no dividend and you doubled your money, so it’s a 100% return (annualized). But what if you bought $1000 worth of Apple stock every quarter for the past 3 years and sold it all tomorrow? Or what if you bought a high yielding stock that’s been paying dividends monthly? Or what about a real estate investment where you take distributions once a year and then sell it 10 years later? How the heck do you figure out the annualized return then? You can’t do it with a simple pencil and paper. This is where the Internal Rate of Return comes into play. I highlighted previously how I invested in college real estate (all the details here) with $50,000 borrowed from my 401(k). Let’s make some basic assumptions for example purposes and you’ll see these reflected in the spreadsheet below. We assume I invested $50,000 in year 1 and then started taking distributions in future years which increase by $1,000 each year due to rent increases. We further assume that at the end of 10 years, net of closing costs, my stake is worth $75,000 due to principal paydown and perhaps some slight capital appreciation. For now, we’ll ignore all the tax benefits like deductions, depreciation, etc. along the way. Without the IRR function, I’d have no way of figuring out my actual return across the 10 year investment horizon. But here it is! So, to get my answer, is used the “XIRR” function, and captured the Date and Total column and also enter a “guess”. This is required for more complex situations where there could be multiple solutions. We don’t have to worry about that for my example, so I just entered “.15” or “.19” or whatever, representing 15%, 19% guesses (which yield the same answer by the way). Don’t stress about the guess entry when doing simply calculations like this. As you can see, this investment shows a pretty nice return at 23.4% annualized! It’s hypothetical, and as you’ll see in my followup real estate post later this week, we already have some challenges, but the key here was to share this tool and how it can be used to calculate annualized returns for more complex situations. 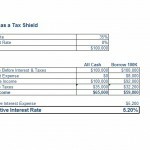 Where Else Can You Use Internal Rate of Return? 401(k), IRA and more – Some retirement plan providers will provide you with an actual investment return of various time periods but others won’t. I find mine to be annoying since it only gives a “year to date”, but not prior year performance. Since plans like this often have monthly inflows coming in, you’d need to understand what your annualized return is with investments across various time periods. The way to do it is with XIRR. Dividend Reinvestment Programs – Similarly, if you’re buying stock partial shares, reinvesting dividends, etc. on a recurring basis, you can’t figure out your return without using the XIRR function. Did You Find the Internal Rate of Return to be Useful? 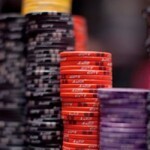 Guy Question: Do You Splurge If You Win Big at the Casino? I’m Borrowing $50,000 From My 401(k) – It’s My Best Option! Interesting! I’m planning to purchase an investment property sometime in the next 2-3 years, and I’d definitely like to apply this principle to figure out my returns. I too found it useful, thank you. 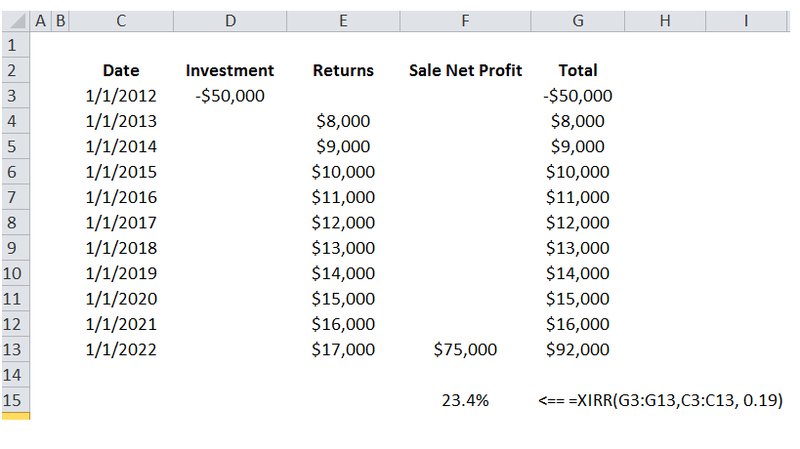 I have a couple of spreadsheets where I track my retirement accounts … I copied all the relevant cells to a new sheet (cash in, dividends re-invests, no withdrawals), and sure enough the XIRR gave me an answer … and it “seemed” right based on my less accurate tracking and “best guess”. What I particularly liked is that the order of transactions is irrelevant to the function, so I did not have to sort the results of the “copy”s … just bam! IRR is the discount rate where the net present value of all cash flows equals zero.